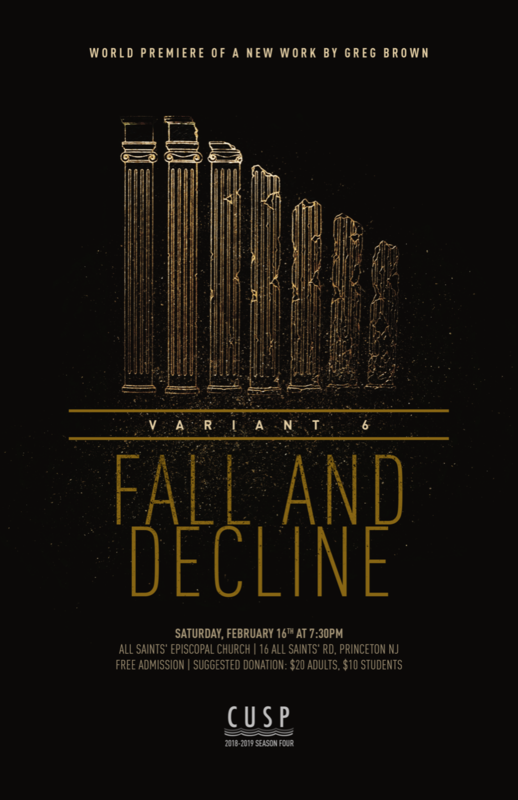 For the final concert of season four, CUSP is proud to host Philadelphia-based vocal sextet Variant 6. Princeton is the second stop on their tour of Greg Brown’s new work Fall and Decline. The piece, composed for voices and electronics, is based on texts of Sadakichi Hartmann, Eprenius, Todd Hearon, Edward Gibbon, and Omar Khayyam. The composition contemplates the inevitable decline of all things natural and manmade. Variant 6 pairs this new work with other pieces for voices and electronics, as well as selections of Medieval and Renaissance music. This concert is FREE! Donations are accepted and appreciated. Variant 6 is a virtuosic vocal sextet that explores and advances the art of chamber music in the twenty-first century. The ensemble's work includes concertizing throughout the United States, commissioning substantial new works, collaborating closely with other ensembles, and educating a new generation of singers and composers. Variant 6 believes that the process of compromise achieved from the diversity of opinion and specialty of its six individual artists can create deeply impactful experiences for its audiences, collaborators, and students.